Becca and Brian's Grand Adventure: Hey dere! Our friends Wade and Chelle are party hosts extraordinaire. Everything from their Super Bowl festivities to their Iron Chef parties to just small get togethers are always extravagant and quite a bit of fun. They put a ton of work into them and really go all out to make it a great experience. (And they throw a mean wedding shower, as Becca can attest to.) As a result, when they sent us an invite to their "Minnesota Nice" party, we were on the case. 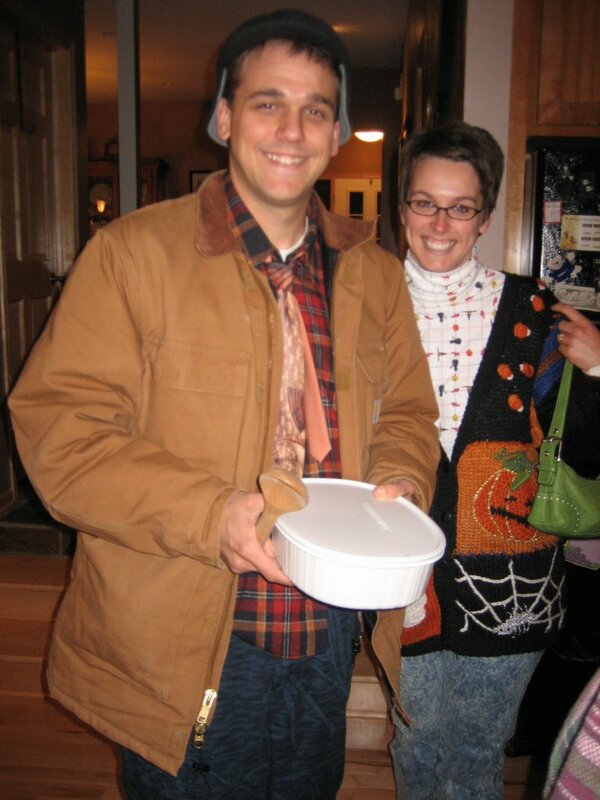 The theme of the party was simple enough: everyone was meant to dress as Minnesotans and bring either a dessert or crock pot (casserole)-related dish. First the food: I briefly contemplated bringing my crock pot Jambalaya but then remembered that might be a wee bit spicy for the sensitive Minnesota palate. Then it came to me: the Davis family speciality. Mayonnaise cake. 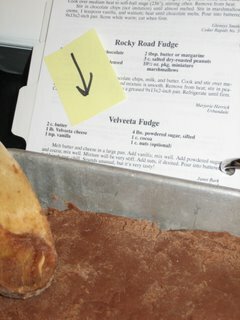 A Davis family recipe for generations, it's not nearly as disgusting as it sounds. In fact it's quite moist and tasty though not easy on the waistline. In fact I was quite confident I would be leading the caloric intake race until we arrived and saw Wade's creation. 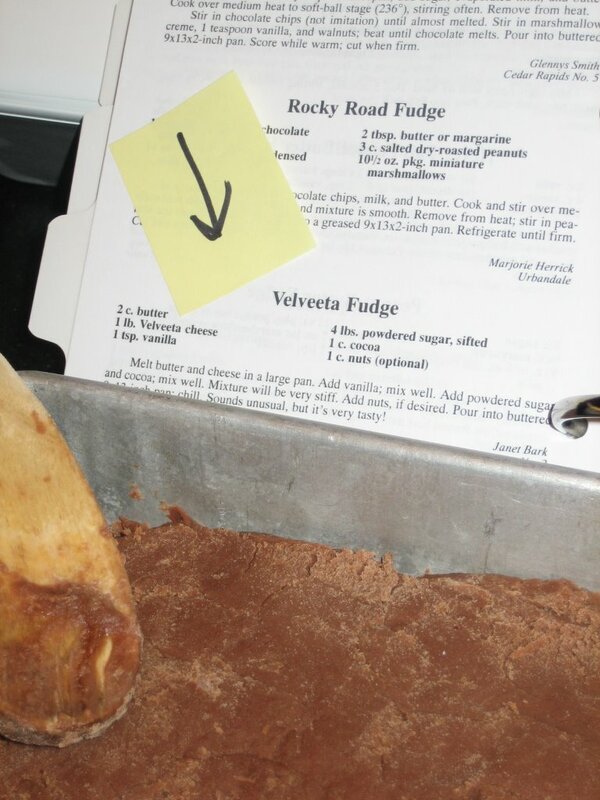 Velveeta Fudge. Seven pounds of materials (including 1 pound of velveeta cheese and 4 pounds of powdered sugar), 12,000 calories and one broken wooden spoon all put into a 9x13 pan. Ugh. Even the most adventurous of us took a VERY small sliver. The rest went to the tech guys at Wade's company (fulfilling the truism that tech people will eat anything if it's free). 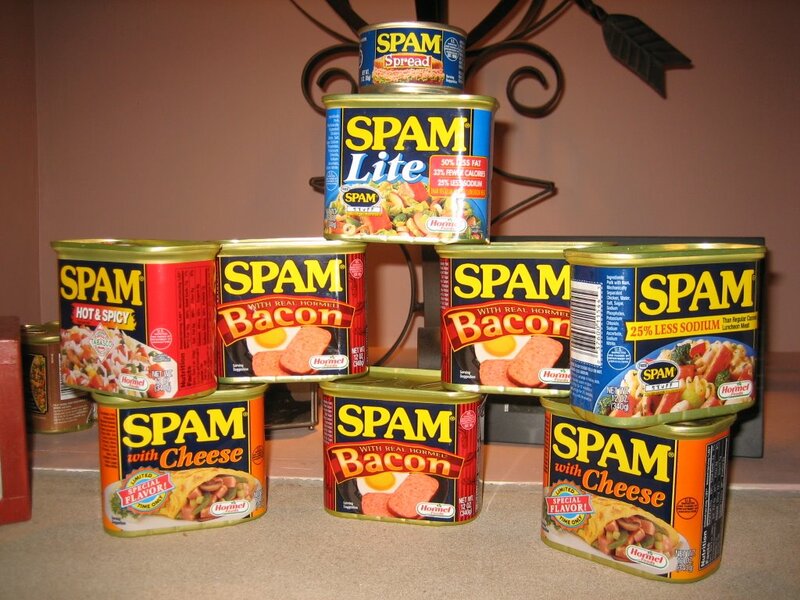 The crock pot creations were a little more standard; tater tot hot dish, wild rice soup, spam casserole, etc. 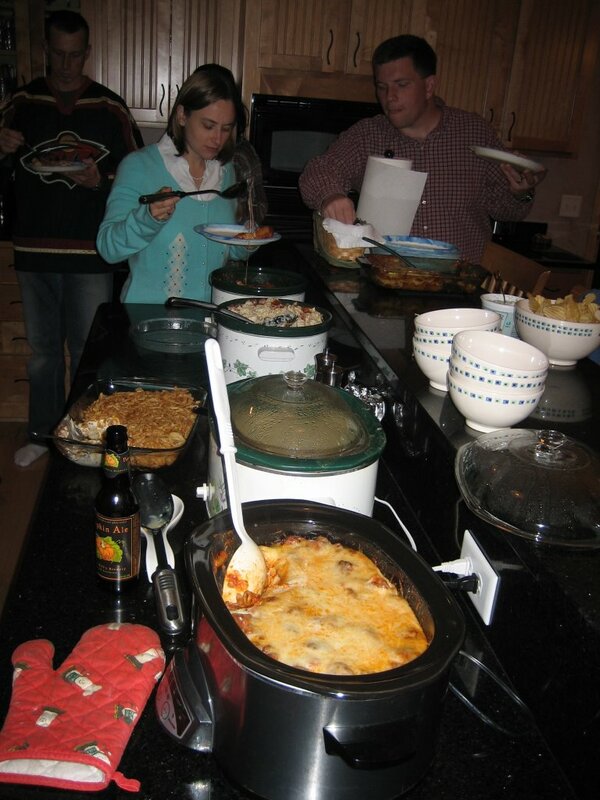 In fact, here is crock pot row in all it's caloric glory. Overall though a good quality of food. One side effect of the food though was the party was a lot lower key than usual. As people tried everything everyone slipped into a serious food coma and sat around on couches. At least people didn't start talking about the church bingo or god forbid the Vikings. 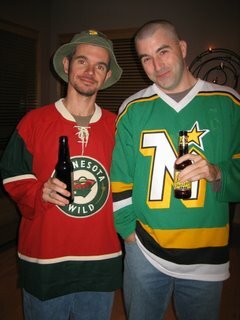 From the sartorial perspective, there was just a lot of plaid and hockey jerseys. However, special props need to go out to Wade Anderson and his wife Sara. They did it up in style. 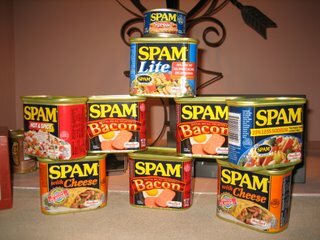 Why use words when pictures will do just fine? And yes, Wade A had waders on and wore them all evening. So there you go, a little slice of Minnesota from me to you, the loyal reader.